Your front desk receptionist probably does A LOT. This person is the first point of contact that visitors and prospective employees have when they come to your company, so you want someone who can handle the many roles and responsibilities well. Michael Ashford, Director of Marketing at The Receptionist is back with us! What does the receptionist handle? There are a number of ways that you can look at the job that the receptionist takes on, and on this episode we talk about eight ways you can structure your business’ front office to meet your company’s needs. Whether your receptionist is focused on being an office manager, has HR duties, or is handling customer service and social media, your receptionist will be juggling a lot. The tasks of a receptionist will vary, and when you’re hiring, you want to find a person whose skills work well for the tasks. But don’t forget about the soft-skills you want your receptionist to have. A successful front desk person will likely show empathy, be friendly but firm, will have relationship building skills, and more. When your visitor’s first impression is so important, and when you want your front office to run smoothly, it might make sense to use some technology to assist you. The Receptionist (our software) works in tandem with your front desk staff. By utilizing our visitor management software to take away some of the tasks that don’t need to be managed by a person, you leave your receptionist available to handle the tasks that could use a more personal touch. This allows your front office to run more smoothly and in a more positive way for your visitors. BTW- we’re biased about how awesome The Receptionist is, so we encourage you to check out our reviews on Capterra and G2 Crowd to see what real users are saying about us. 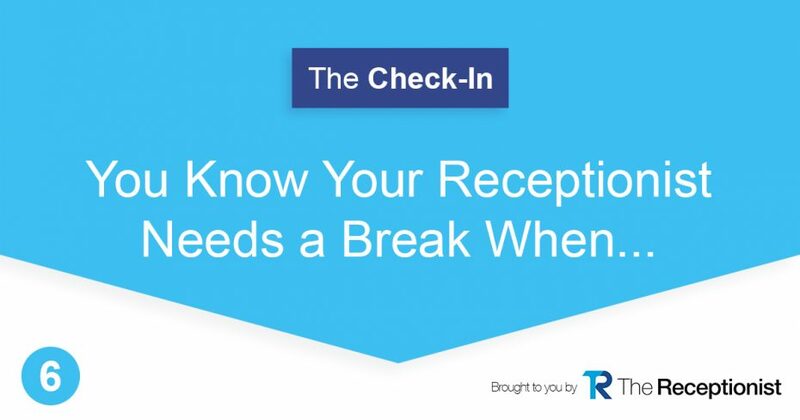 And, as if we haven’t already packed enough good stuff into this episode, we close it out with a David Letterman-style Top-10 list about how you know your receptionist needs a break. (Don’t know David Letterman? Oh man…Google him, but only when you have time to get sucked into the vortex of YouTube). We say we’re awesome, but don’t take our word for it. Check out customer reviews here and here.